Ultrex is a single braid rope of 100% UHMWPE fiber with a Maxijacket coating for superior abrasion resistance. Its braid angles and twist level are designed to optimize break strength. With better bend-over-sheave resistance than other high-modulus fiber ropes, Ultrex has zero water absorption and maintains its flexibility even in freezing conditions. Ultrex has the strength you need to serve as a wire rope alternative! Commonly used as a rigging rope by arborists, a guyline or guyline extension for loggers or even as a winch line for both recreational and industrial users. It's the best synthetic choice for a cable replacement product! 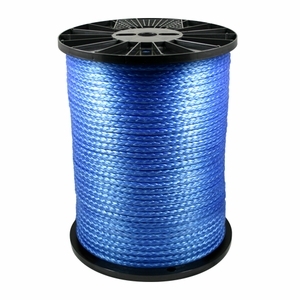 Or, if you already know that you want 100% UHMWPE (commonly called out as Dyneema / Spectra) rope for your winch, then check out our pre-spliced Ultrex Synthetic Rope Winch Lines, available in popular diameters and lengths.